The Association of Strong Women Alone (ASWA) membership grew to 56,693 covering 137 blocks in all 33 districts of Rajasthan state. Leaders are taking responsibility of ASWA and actively participating in expansion, proving themselves as good resource persons in all trainings and meetings and in dealing with problems and issues brought to the block committee meetings. Registered body of ASWA has run successfully the family counselling centre (Mahila Sureksha Salah Kendra) and executive of the society is taking independent decision and attending government meetings of MSSKs’ network. When asked from the Government about list of Association members as base to include for receiving entitlements declared in the Food Security Ordinance but leaders of ASWA decided to inform the government that they should make provision at the Gram Panchayat level for inclusion of all poor Single Women, regardless of whether they are ASWA member or not. 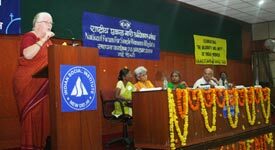 Mature leadership in General body of National Forum for Single Women’s Rights (NFSWR) seen as an example that members of Himachal Pradesh are taking responsibility to helping neighbouring Punjab women get organised; led several lobbying delegations – visited Central Government Offices and presented their case strongly. Visibility of National Forum. National and state level lobbying and advocacy on tribal issues resulted in amendment in the PESA Act by the Rajasthan state government about forest produce collection, State Excise commissioner (Udaipur and Jodhpur) issued directives to the District Collectors about clause-29 of PESA rules 2011, formation of PEACE committees has started at revenue village level. Hon’ble Governor of Rajasthan presented issues of tribals in Convention of 5th Schedule State Governors. The Commissioner – Tribal Area Development Agency (TADA) issued orders to approve the claims presented in the ‘administration towards villages’ camps. Astha is working in partnership with 76 organizations in Rajasthan and has played a critical role strengthening the campaign. It has not only mobilized people in the field but has contributed to promoting tribal leadership at the state and national level. Astha’s emphasis on tribal culture, identity and world view is much appreciated by network partners. 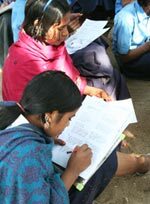 Astha has played successful role in planning and implementing national advocacy campaign. Astha and its network partners have successfully lobbying with the state government to revise the PESA norms. This has facilitated tribal community to slowly start taking control of village developments. Astha in association with the ‘state campaign for right to work and right to information’ able to lobbying with Rajasthan state government to increase minimum wages and link it to inflation. The constant struggle of the organization has led to improvement in the implementation of MNREGA. Efforts resulted in increased minimum wage for MNREGA work – it is increased from Rs. 100 to Rs 149 in the programme, which has benefitted to all persons engaged in MNREGA work throughout the Rajasthan state. There is an ongoing struggle to increase the wage to Rs. 166 per day in line with the minimum wage of the State. Due to regular campaign by Astha and POs – people are submitting work demand applications and ensuring that receipts are given when work is demanded. However, the monetary gain was to the tune of INR 59.3 million (INR 5.93 crores). Women have access regular access work through MNREGA, it is a source of steady income to tribal women. In addition, they are also able to access better wages in the open market. State government organised workshop on subject “Social customs and manner – Revenge, Witch calling becoming objector in development of Tribal Community”, representatives from the Rajasthan Tribal Rights Forum participated and nominated in the committee formed to work in this direction. Due to intensive advocacy efforts of Budget Analysis Rajasthan Centre (BARC) along with other budget groups and organizations working on dalit and tribal issues, the allocation in the budget for SCP and TSP increased from 2-4% of State’s total plan expenditure in 2007-08 to 9-11% in 2014-15. The advocacy work in this regard also included communicating with MLAs of Rajasthan who raised questions in Vidhan Sabha based on BARC’s analysis. Also, BARC along with National Coalition on Legislation of SCP and TSP presented Charter of Demands to the Chief Secretary (Government of Rajasthan) and demanded legislation of SC-SP and TSP Bill in Rajasthan. The constant efforts lead to the releasing of draft for SC-SP and TSP Bill, 2013. BARC further presented suggestions on the draft. Local Self Governance Resource Unit continues its efforts to improve governance and capacity building of Elected Women Representatives (EWRs), this year unit focuses its work to include issues of women in the panchayat agenda. Discussion started on domestic violence, violence against women. Developing Gender Panchayat Resource Centre in selected panchayats is one the action in this direction. Organising sensitisation activities with the service providers and administration is also the work the unit did. Work of these EWRs helped poor women to get benefit of government schemes and effective work done in direction to prevent women from violence. Organising public hearing on implementation status of Right to Education Act in different area made effect on education and administrative structure. Now, administration become alert with regard to RTE implementation and government is focussing attention on it. Astha’s organising work with the People with Disability (PWDs) and strategy of forming District People’s Organisation (DPO) influenced policy of Sightsavers and four organisations of Rajasthan will form DPO in their working area and will part of state and national level network to do lobbying of issues of PWDs.